The Woodstock Byrdcliffe Guild’s 18th Annual 5 by 7 Show launches Friday, December 1, with a catered champagne reception and preview party at the Kleinert/James Center for the Arts from 5:00 to 7:00 pm, one of the most exciting art events happening in Woodstock each holiday season. All work submitted is restricted to 5 inches by 7 inches in size and is exhibited anonymously, a playful way to give equal voice to all and showcase the talent of our members side by side with that of the international art world community in our midst. 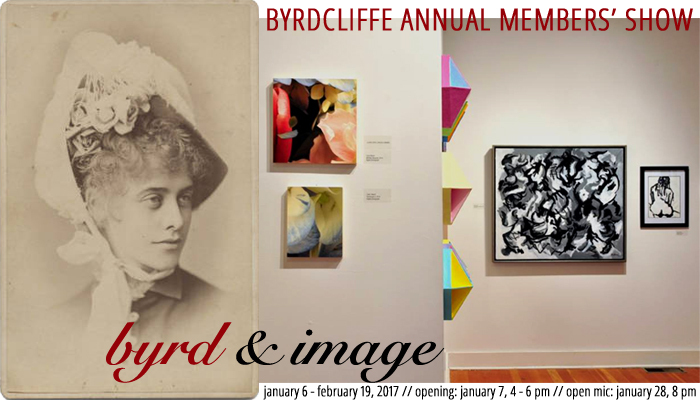 This is a major fundraising event for Byrdcliffe, and by contributing and/or purchasing a small work you will help support our arts programming, including exhibitions and performances. 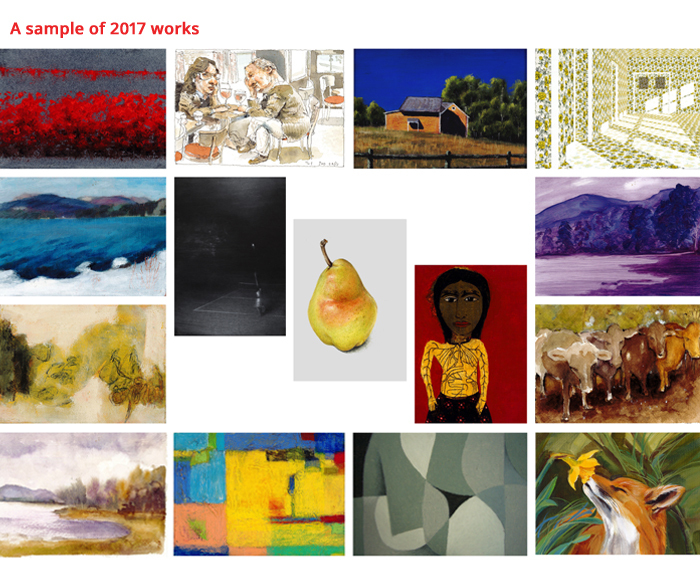 The 2017 Annual 5 by 7 Show is proudly sponsored by ARTSYSTEMS and Karen and Les Walker. The food at the Preview Party was this year provided by Blue Mountain Bistro-To-Go. Participating artists: Nancy Azara, Edgar Cardenas, Matthew Fasone, Julie Heffernan, Samm Kunce, Ian Laughlin, Iain Machell, and Alison Moritsugu. Left: Nancy Azara, THE GHOST SHIP, 2016. Vine, gesso, paint, & aluminum leaf on wood posts, 4′ x 12′ x 1.5′ // middle: Iain Machell, ROCKS + RIVERS (detail), 2016-2017. Black walnut ink on polypropylene. Installation, dimensions variable // right: Julie Heffernan, Self-Portrait as Infanta on Eggshells, 1999. Oil on canvas, 68″ x 49″. Loaned courtesy of Jacquie Littlejohn. Click here to see the Drawing Sound Exhibition Catalog. Curated by Oscar Buitrago, Kerrie Buitrago, and Melinda Stickney-Gibson. This exhibition is generously sponsored by The University of Edinburgh and The Hope Scott Trust Fund. Workshop: Sunday, August 27, 2017, 1:00 – 3:00 pm. Participants will create hand-drawn scores which will then be performed by the musicians; free, all ages welcome. Left: Jo Ganter and Raymond MacDonald, Time Points, 2015. Archival inkjet print, 11.75 x 16.5 inches // right: Jo Ganter and Raymond MacDonald, Running Under Bridges, 2015. Archival inkjet print, 39.5 x 59.25 inches. Curated by Derin Tanyol. Exhibition generously sponsored by Five Partners Foundation and the Milton and Sally Avery Arts Foundation. Left: Philip Guston, Untitled (Roma), 1971. Oil on paper, 18 x 24 inches. 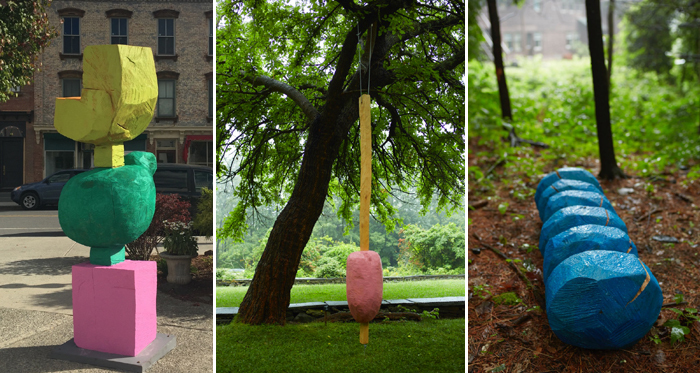 Woodstock Artists Association & Museum, Gift of Dan Kadish // right: Thomas Sarrantonio, Etude, 2013. Oil on paper, 5 x 5 inches. Courtesy of the artist. The artists in the show are: Laura Battle, Emily Berger, Benigna Chilla, Susan Spencer Crowe, Ann Feitelson, Anne Francey, Lisa Hoke, Mona Mark, Altoon Sultan, and Stephen Westfall. 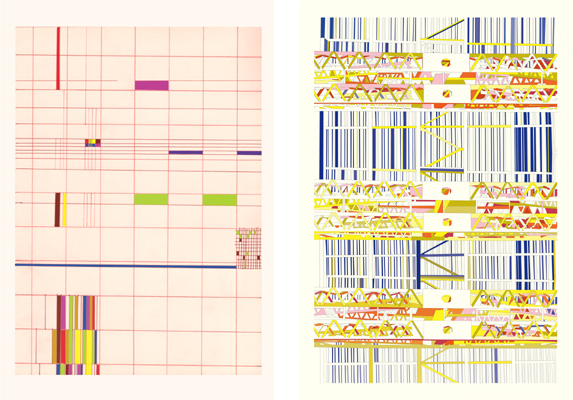 Left: Benigna Chilla, Vertical Weave, 2010. Intaglio monoprint, 30 x 22 inches // right: Susan Spencer Crowe, Chatham, 2016. Encaustic and cardboard, 20 x 10.25 x 4.5 inches. Curated by Katharine L. McKenna. Participating visual artists: Samira Abbassy, James Adelman, Ann Arden McDonald, Dottie Branchreeves, Meghan Burke, James Byrne, Caitlin Cass, Gabe Chiarello, Alexis Elton, Silvia Forni, Stephanie Gammara, Kayla Gibbons, Dan Gratz, Isabella Hackerman, Amber Hany, Jess Harvey, Robert Hickman, Paul Hunter, Robert Kolhouse, Christopher Law, David Leonard, Vanessa Madrid, Henrietta Mantooth, Michele Mirisola, Meredith Nichols, Padma Rajendran, Jessica Sandford, Charles Shields, Lori Solondz, Grace Sachi Troxell, Tara Vaughan, and Ella Weber. Left: Robert Kolhouse, Woodstock.exe. White earthenware and glaze, 20 x 15 x 10 inches // right top: Jessica Harvey, Ghost Vessels, White Pines. Archival inkjet print, 11 x 14 inches // right bottom: Vanessa Madrid, White Oval — I Have an Inner Rainbow. Oil on burlap, 26 x 23 inches. 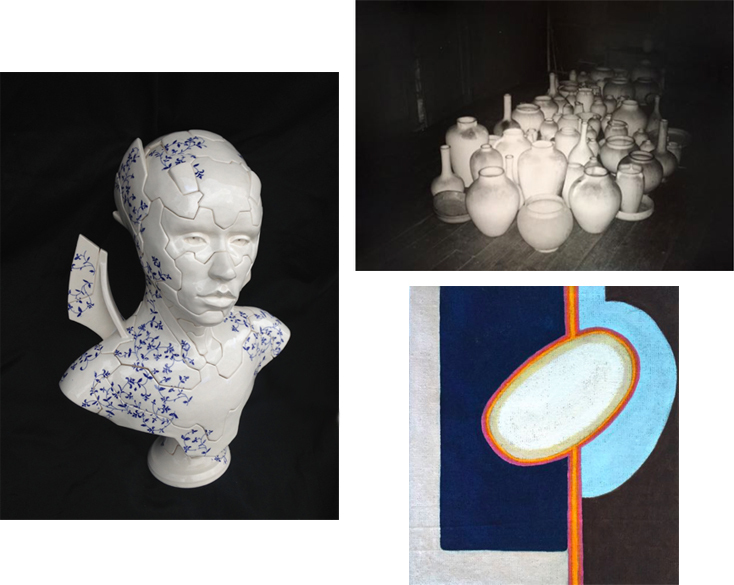 Selections: Woodstock Ceramic Arts Today features work by contemporary ceramicists from the region: Rich Conti, Eric Ehrnschwender, Sophie Fenton, Mary Frank, Robert Hessler, Alan Hoffman, Jolyon Hofsted, Brad Lail, Young Mi Kim, Joyce Robins, Arlene Shechet, Grace Wapner, and Elena Zang. Selections: Woodstock Ceramic Arts Today highlights a major feature of Byrdcliffe’s interdisciplinary mission. The Woodstock Byrdcliffe Guild, whose programming includes exhibitions, classes, musical performance, and an artists’ residency program, is renowned for its ceramics program, which dates from the early days of the Byrdcliffe Art Colony. 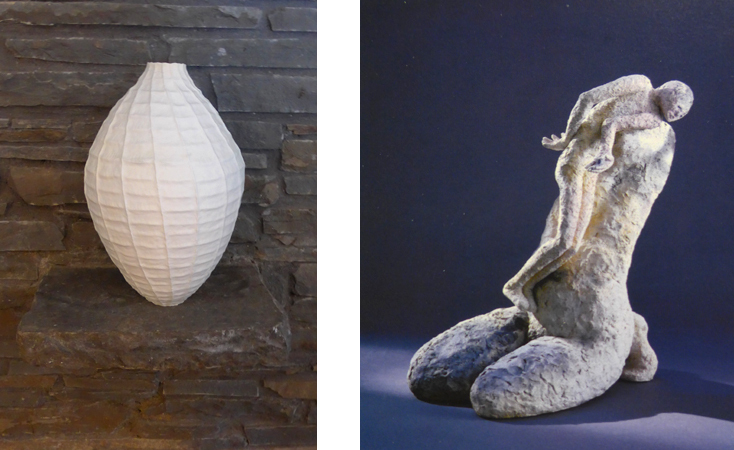 Selections complements the exhibition currently on view at the Samuel Dorsky Museum at SUNY New Paltz, Carl Walters and Woodstock Ceramic Arts, which runs from February 4 – May 21, 2017. The Dorsky exhibition focuses on Walters’s ceramic sculpture, as well as his functional ceramics—plates, bowls and vessels. Ceramics made by artists who worked at the Byrdcliffe Art Colony, including Zulma Steele, contextualize his work. The exhibition at the Kleinert/James Center for the Arts moves this history forward, demonstrating the breadth of production in the ceramic arts since the early days of the Woodstock Art Colony. The exhibition will be cohosted by the Historical Society of Woodstock, 20 Comeau Drive. The Historical Society will be open on Saturdays and Sundays during the run of the exhibition, February 24 – April 9 2017. For hours and more information, visit www.historicalsocietyofwoodstock.org. Left: Young Mi Kim, Orenda 1. Porcelain, reduction fired. 18.5 x 12 inches // right: Grace Bakst Wapner, And Hugged the Narrow Ledge. Ceramic, 15 x 10 x 13 inches. All 2017 Byrdcliffe arts programming is made possible by the New York State Council on the Arts with the support of Governor Andrew Cuomo and the New York State Legislature.